Need a state of the art gaming PC? Got $3,000 to $8,000? No? Then you probably don't want to head over to www.BFGSYSTEMS.com, where the BFG's new Phobos systems have just gone on sale. Most people know BFG for their graphics cards, but they're looking to make a splash in the high-end gaming / home theater PC industry now with their Phobos line, which garnered rave reviews at their debut at CES earlier this month. The system comes in three starting price points - $3,000, $5,000, and $8,000 - each with what I assume is thousands of dollars worth of bells and whistles attached. Each features water cooling of some sort, with the higher end featuring quad-SLI GeForce GTX 295 1.79GB cards, a dedicated 1GB card for PhysX, and 6GB of memory - and that still leaves room for another $3,000 worth of upgrades. To put that in layman's terms, yeah...it'll run World of Warcraft. They're really drool-worthy systems, though the BFG Technologies brand and I have never really been friends, after that horrible summer when I returned my 6800 GT video card four times before they found a working one. They've got one hell of a warranty though (concierge service? ), so if you have the means you might considering heading over to www.BFGSYSTEMS.com and giving them a gander. 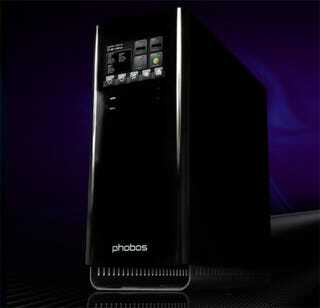 Phobos is designed to deliver unbelievable performance. The ‘Phobos Elite’ configuration features the Intel® Core i7 965 Extreme Edition 3.2GHz Processor, two BFG NVIDIA® GeForce GTX 295 Graphics Cards, and CoolIt® Contained Liquid Cooling Solutions to keep both the GPUs & CPU cool during the fiercest of gaming battles. BFG Tech also outfitted Phobos to serve as a home theater command center by choosing Windows® Vista Ultimate with Media Center, including four hard drive bays, offering RF remote and TV tuner with DVR functionality, a front slot-loading Blu-ray Disc® drive, the option for 5.1 or 7.1 surround sound audio cards, and an integrated iPod®/iPhone® syncing dock. For more information about Phobos, contact PR representative Mark Olson at 305.576.1171 x17 or markolson@maxborgesagency.com, or visit www.bfgsystems.com. For additional information about BFG Tech please visit www.BFGTech.com. *Based on current configuration at the time of printing. Specifications and available options subject to change. See www.bfgsystems.com for updates. Refined Aesthetics. Unbelievable Performance. Concierge Service.